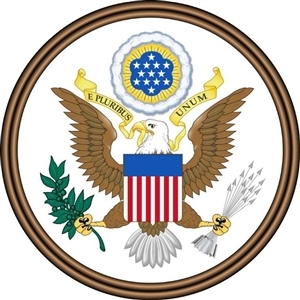 E Pluribus Unum: the Great Seal of the U.S.
One of the lesser-known events of July 4, 1776, was that Congress appointed a committee to design a seal for the new nation. They submitted their proposal on August 20, but it wasn't approved. Six years and two more committees later, Congress approved the Great Seal in 1782. It appears on everything from the President's podium to the one dollar bill. One element in the design goes all the way back to the original proposal in 1776. It's the eagle, holding a ribbon in its beak with the words, "E Pluribus Unum" meaning, "Out of many, one." Those words were the de facto motto of the United States until 1956, when Congress adopted "In God We Trust" as the official motto. There's another story behind that, but the original motto is hard to beat. "One, out of many" lifts the vision of different kinds of people from diverse regions and backgrounds being drawn into "one nation, indivisible, with liberty and justice for all." There's nothing new about the tension over federal vs. states power or intense political differences, but it seems that today we are hell-bent to become "many out of one" instead of "one out of many." The venomous forces of non-negotiable political ideologies keep pulling us apart with little or no regard for what the pilgrim founders called "the common good." But "oneness" doesn't mean we all become bland, boring copies of each other. Paul celebrates the amazing diversity of the many who become one in Christ: "But each of us was given grace according to the measure of Christ's gift." The same way the Spirit brooded over chaos in the book of Genesis and brought forth the infinite variety of creation, the Holy Spirit is at work in the lives of baptized followers of Jesus Christ to release an almost infinite variety of gifts, all of which, Paul says, are united in one common purpose: "to equip the saints for the work of ministry, for building up the body of Christ until all of us come to the unity of the faith and of the knowledge of the Son of God, to maturity, to the measure of the full stature of Christ." That's what it looks like to see the Spirit of God at work through the life of the church. Rev. Jim Harnish is Senior Pastor at Hyde Park United Methodist Church.